Posted on Thu 23 Jul 2009 at 1:39 AM PST. Filed under Filmmaking. I had a shock tonight. I was watching the most popular YouTube videos for the day, and I stumbled on this and this video, promotional clips from the new movie “Funny People“. The clips felt very video-like, they had nothing from the $70 million look that the movie cost to produce. Which of course gives us hope that our consumer HD cameras can produce great-looking video if we knew how to post-process it. I tried to find which camera was used, but to no avail (it has a digital look though). Later, I searched and found the trailer at Apple’s site to try to see more of the movie’s scenes. When I watched the trailer though, it was a completely different look. Obviously, the YouTube clips were ungraded!!! The actual trailer really did look like a Hollywood movie! I can’t believe how the colorists were able to make this originally terribly-looking movie to look so good. Check the before and after! Of course, there’s always the chance that the Youtube clips were the ones that were graded to be super-contrasty for some reason, or that whoever exported these clips messed them up, but I don’t think so. It really feels like the youtube clips are the original ungraded clips, and the trailer was graded. Which shows us how important grading is. 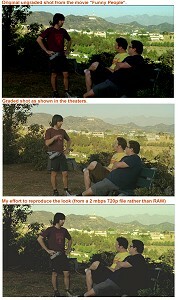 You could take any digital HD camera and make it look as fabulous (as long as you have access to RAW). Update: I played with the HD YouTube clips and tried to reproduce the look. And while I was working with the useless (for color grading needs) 2 mbps YouTube clips, I was able to get pretty close to the trailer look (I would need the movie’s RAW files to be able to completely emulate it). Which means that the YouTube clips are *definitely* the original clips, as they came out of the camera, ungraded! If *I* was able to get so close with these useless 2 mbps files, the movie’s colorist could very easily get to that trailer look with his RAW 4k files. 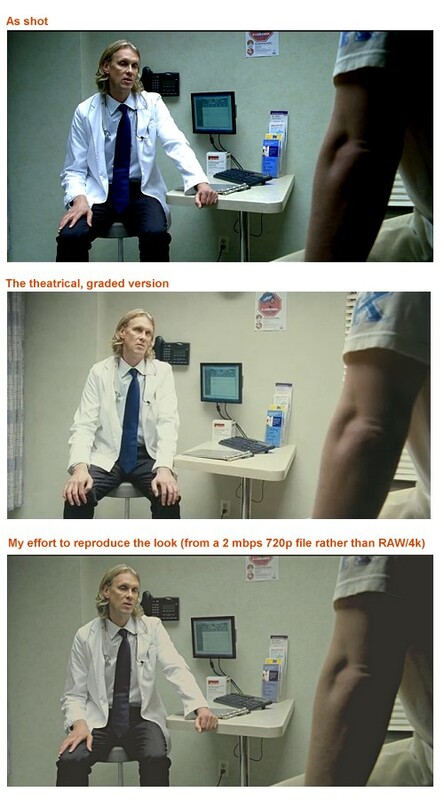 Which again, it shows us that if we know how to light, frame, shoot, and grade, we can get the “film look” even with a consumer HD camera (of course we would have to try a bit harder, but it’s possible). No need for 35mm adapters. I used the freeware Aav6cc plugin (saturated greens and yellows, desaturated reds), Sony Vegas’ “Contrast” plugin (-16 value), and the “Color Corrector” plugin (low saturation, higher gamma, a bit of offset, mids+lows towards yellow). Piece of cake, huh! Update 2: One more. Again, I would need the original RAW/4k files to do better than that.